Vegan Chocolate Chip Cookie Dough was posted on June 16th, 2011 and is filed under Dairy Free, Desserts, Kid Friendly, Recipes, Vegan. This entry has 23 comments. You can follow any responses through the RSS 2.0 Comment Feed. I have a confession. When I make cookies, I really don’t want the cookies…I want the dough. I’m not even really a cookie fan (unless there’s serious chocolate involved)…ah, but the dough…It’s. Just. So. Addicting. So yesterday I invented cookie dough that is, politically speaking, “safe” to eat. A vegan version. Frankly, whether or not there are raw eggs in the dough I’ll still pick away at it…but this is definitely a friendlier version. At first I wasn’t sure what I was doing. I was playing around with making a cookie dough party dip (I’ve been seeing these go around and they look amazing! ), but I didn’t have anything to dunk in it. Then I thought I’ll make cookie dough bars that you freeze…which I did make (picture below), but then I thought people might not be as odd as me to eat cookie dough straight from the freezer. My last idea was the best…cookie dough ice-cream. Yes. I have to admit, that if I were to go to Dairy Queen, (proverbially speaking, of course) that the Cookie Dough Blizzard is what I would go for. Okay…once in a very, very blue moon I do go and get a small blizzard. I know, they are complete junk…but I figure once a year… (wow, there is a lot confessing going on in this post!) Anywhoo…obviously, the idea sounded very inviting. One serving would be about 1 tablespoon. Cream the margarine and the sugar really well. Add the rest of the ingredients and mix thoroughly. This makes enough for 13 servings of ice-cream (for about a half a cup of ice-cream) so I just keep a bowl in the freezer for when the occasion arises. You can use this as a topping on my vegan “Blizzard” recipe…simply substitute the “oreos” for the cookie dough. Or use it on my vegan vanilla milkshake! 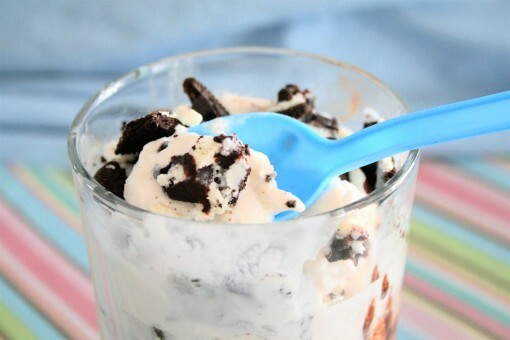 Or maybe you prefer “Oreo Ice-Cream” over cookie dough…so then, eat this! 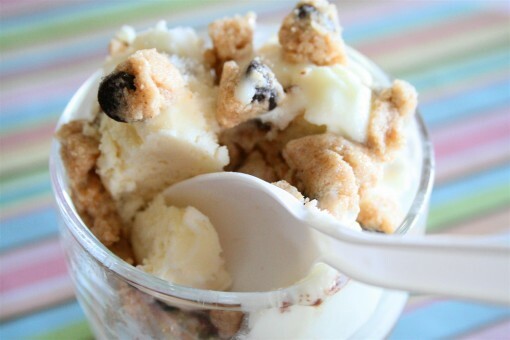 What’s your favourite ice-cream topping? I’m horribly guilty of eating cookie dough, but I find I like the baked version better. Those frozen bars look awesome! Kelly~ Oh, that one is sinfully good too…I may have to make a healthy version of that one now! Jessica~ Dairy free caramel…I actually a recipe similar to it if you search for caramel apple dip on my site. Dianne~ Earth balance is a vegan margarine. Jessica~ Aw, thanks! You’re welcome back anytime! I’ve got to try this out – especially as a blizzard! Is vegan healther? And im trying to lose weight. Will this vegan stuff help? And SO happy u made this cookie dough!!!!!! Maddelyn~ Vegan isn’t necessarily healthier. Make your life simple by amping up the fruits, veggies, proteins, and reduce carbs. Reduce sugar and processed foods and you should notice a difference in weight…especially if you amp up your workouts. It’s all calories in and calories out, so listen to your body and watch portion sizes. :) Hope that helps! … and I mean just the cookie dough. Not mixed with the ice cream. Krys~ Sorry I didn’t put it there…I believe it’s for one tablespoon per serving!